Graveside services are scheduled for 10 a.m. Saturday, May 20, at Woodbine Cemetery for George Edward Fitzpatrick IV of Roswell. Fitzpatrick, 70, passed away Saturday, May 13, 2017, at Eastern New Mexico Medical Center in Roswell. Richard Emery will officiate at the services. Visitation will be held from 10 a.m. – 8 p.m. Friday at Terpening & Son Mortuary. George was born July 14, 1946, in Carrizozo, the son of George Edward Fitzpatrick III and Lura (Leslie) Fitzpatrick. On Nov. 29, 1965, he married Karilynn Schull in Carlsbad. He served in the U.S. Army during the Vietnam War and was a lifelong resident of Artesia. 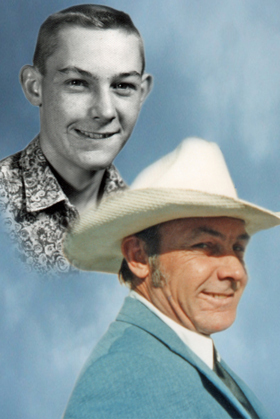 George was a driller in the oilfield, a member of the Church of God, and enjoyed cutting wood and gardening. He loved spending time with his grandchildren and great-grandchildren. Survivors include his wife, Karilynn Fitzpatrick, of Roswell; sons Danan W. Fitzpatrick of Roswell, Curtis G. Fitzpatrick and Louann Garcia of Roswell, Travis M. Fitzpatrick and wife Connie of Manila, Philippines, and Freeman Smith of Spartanburg, S.C.; daughter Jodie K. Cota and husband John of Caddo Mills, Texas; brothers Bill Fitzpatrick and wife Jeannie of Roswell, Joe Fitzpatrick and wife Sandy of Midland, Texas, and James Fitzpatrick and wife WaFawn, Robert Hopkins, and Elmer Hopkins and wife Diane, all of Nogal; sisters Kathleen Holmon of Longview, Texas, Evelyn Dobbs and Cherie Williams, both of Roswell, and Mary Ann O’Dell and husband Thomas of Nogal; grandchildren Derek, Jennifer and Alex Pitts, Cody Fitzpatrick, Leslie Fitzpatrick, T.J. Scott, Andrew Scott, Jessica Cota, Dara Martinez, Ashly Frahm, and Matthew, Donovan, Cynthea, Travis II and Alexis Fitzpatrick; and 12 great-grandchildren. He was preceded in death by his parents, George Edward Fitzpatrick III and Lura Fitzpatrick Hopkins; brothers Emmitt Fitzpatrick, Paul Fitzpatrick, Patrick Fitzpatrick and Graham Fitzpatrick; and grandson Brandon Sean Fitzpatrick.